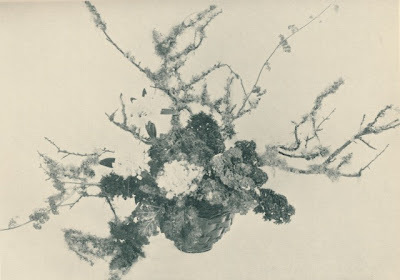 Before winter is over, I plan to do as Constance Spry once suggested and create an arrangement made entirely of kale. For dining, I'm more of a collard greens person myself, but collards just wouldn't have the same effect in an arrangement as kale. Kale has that wonderful texture thanks to its curly leaves. Spry's kale arrangement reminded me of some beautiful table settings that I have seen in which vegetables and fruits were the main decoration. Now we're not talking about watermelons cut to resemble baskets holding fruit salad or hollowed out heads of cabbage doing duty as dip bowls. (Although I have to say that I am fond of those watermelon baskets.) Rather, I'm thinking of more organic, natural arrangements like those on the tables of designer Diane Burn (a photo of her dining room is above) and Julie Janklow (see below.) Don't those vegetable centerpieces remind you of Dutch still lifes? The Burn table looks like a vegetarian Lucullan feast. 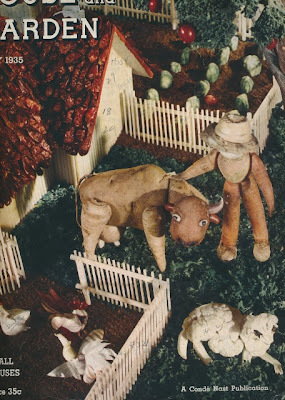 And then last week, I saw the cover of the July 1935 issue of House & Garden in which a farm scene was created entirely of vegetables. Clever yes, but not quite as elegant as the Burn and Janklow tables. Still, it was in keeping with the fruit and vegetable theme that has been running through my head, so it seemed appropriate to include in this post. Anyway, take a look below and you might be inspired to create your own vegetable tableaux. The beauty of these arrangements is that they can always be used later for stew or soup. Spry considered kale to be "one of the most valuable of all plants for winter decorations." The arrangement at top included Purple Kale and Callicarpa Berries, Mauve Rhododendrons, and Grey Lichen. 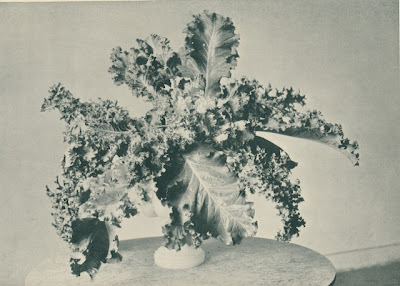 The second arrangement was far more simple, composed only of kale leaves. 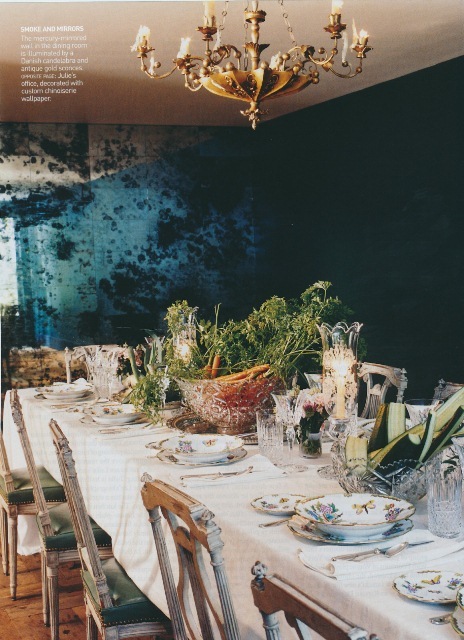 Julie Janklow's dining table set with a large cut-crystal punch bowl holding carrots and another bowl containing large strips of cucumber. The cover of the July 1935 issue of House & Garden. The cow appears to be made of a potato and parsnip body and legume ears. I especially like that cauliflower sheep. 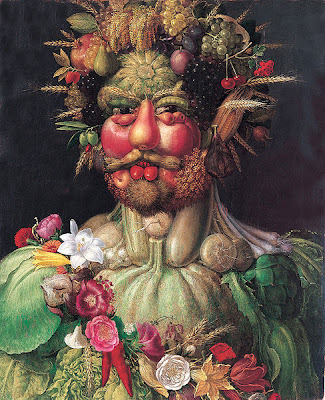 Of course, no post on fruits and vegetables would be complete without mentioning Arcimboldo and his fanciful paintings. "Vertumnus" (c.1590-91), seen above, depicts the Holy Roman Emperor Rudolf II as the Roman god of the seasons. Photo of Diane Burn's table from Architectural Digest California Interiors ; Spry photos from Flowers in House and Garden by Constance Spry. Janklow photo from an old issue of Vogue. I caught a bit of Suzanne Rheinstein's presentation of her homes at the Nashville antiques show. She likes to dispay lettuce in a glass bowl as a centerpiece for the dining table in her Manhattan apartment. My dear friend Andrea of the French Basketeer loves a table centerpiece featuring natures bounty! Great post, and so many possibilities here, Jennifer, but one in particular comes immediately to mind for a small table. I remain quite partial to the old springtime standby of lemons and/or limes in a heavily-plated Revere bowl with a few overlaying white blossoms for added interest- dogwood blossoms being my favorites. Although some may call it frumpy or unsophisticated, I see this look as simple, all-American and pretty damn chic. 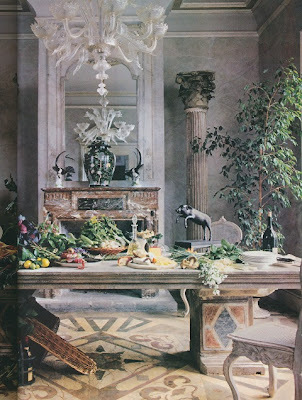 Classicist- I do like the idea of Suzanne's lettuce centerpiece. My problem might be finding a head of lettuce at the grocery store that doesn't look chewed up! Karena, Does she have a blog? Barnabus- It doesn't sound frumpy or unsophisticated in the least. Really quite the opposite. I think that the use of white blossoms helps to soften the grouping of lemons and limes and adds nice interest. What a great post and very inspiring. I may work it into my table for tomorrow night! Kale salad has become a favorite of mine, too, with toasted pine nuts and a lemony vinaigrette. Let it sit in the dressing for a few minutes before serving to soften it. As it happens, Diane Burn, the interior designer whose 'kitchen' you presented as the lead image, was a friend of mine. Her house, former, is on Pierce Street in Pacific Heights, not far from where I live. Next time you are in town, i will show it to you. I say 'kitchen' in quotes...like me, Diane did not cook. And this whole elaborate scene was strictly for the photography shoot. The photographer was another friend of mine, Russell MacMasters. Frances- Silly me. I never thought to eat Kale raw. That salad, though, sounds divine so I will try it! Diane, A small world! I would love to see it sometime in person. Maybe my next trip to SF? I love using purple kale in arrangements in the summer - I'm afraid here in the Northeast, it's impossible to find - even in the poshest of grocery boutiques.